Imagine what it would feel like if a factory worker pulled you from a cage and rammed a pipe down your throat and force-fed you pounds of cornmeal every day as you gagged and suffered throat injuries. Imagine your fear, feelings of sickness, and pain. 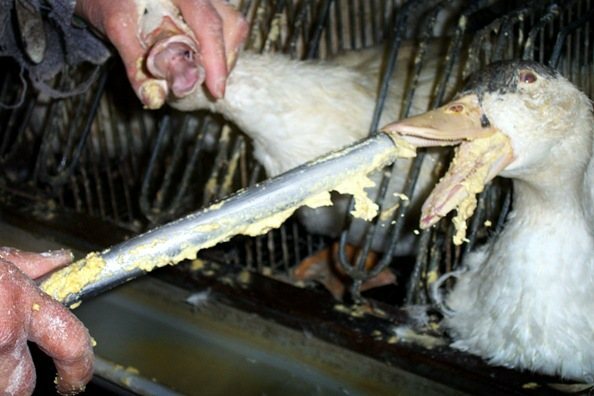 This ungodly process is a reality for millions of ducks and geese languishing on factory farms. Do you know how you like to eat from your hand and stop eating when you’re full? So do ducks and geese. 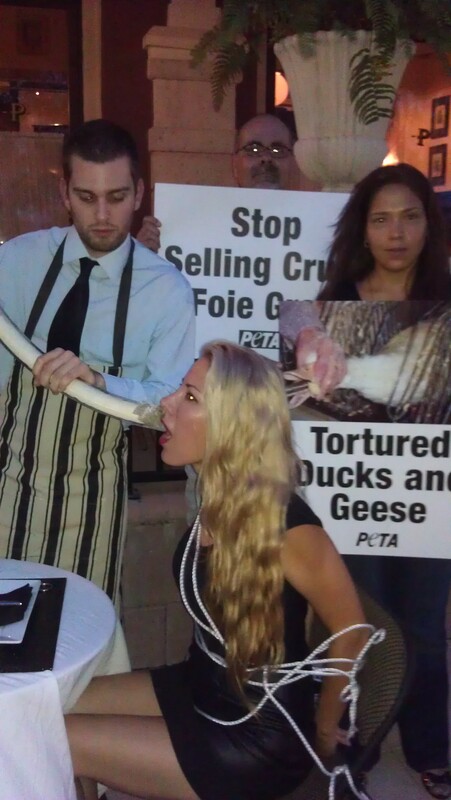 I recently sent a letter to several South Florida restaurants asking them to stop selling foie gras, the fattened liver of ducks and geese force-fed pounds of corn mush every day — the equivalent of force-feeding a human 14 lbs. of spaghetti a day. No animals endure more cruel treatment on factory farms. The force-feeding results in tumors and blood-dripping gashes in their necks. They live in fear of their next feeding in small wire cages from the time they’re just a few weeks old. The process of making foie gras is so inhumane that 14 countries banned it and California recently made selling it illegal. Given advancements in the culinary arts and the ability to replicate a faux foie gras, restaurants have no excuse to sell the diseased and tortured remains of a duck’s or goose’s liver. As a result, we asked restaurants to consider humane menu alternatives, including plant-based options offered by several other local restaurants. In light of the growing popularity of foods such as Gardein sprouting up on the menus of mainstream restaurants like Yard House, it’s an easy and profitable decision welcomed by an increasingly progressive customer base who think about their food before they eat it. After reading my letter and watching a video documenting the making of foie gras, the restaurant owner at Pistache in West Palm Beach, Florida declined to stop selling it stating its profitability as a justification. Sadly, the restaurant passed on an opportunity to make a historic statement of kindness and instead chose to preserve the status quo at a time when even McDonald’s is capitalizing on the growing trend in vegetarian eating. As a result, with the help of People for the Ethical Treatment of Animals (PETA), currently engaged in their own effort to stop Dean & Deluca to drop foie gras, we organized a demonstration in front of their restaurant simulating a force-feeding to raise awareness about reasons to stop selling and buying foie gras for their patrons and to persuade the restaurant owner, manager, and chef to reconsider their decision so we can celebrate an act of compassion over cruelty. During the demonstration, volunteers recreated a force-feeding scene, held signs, and passed out literature to curious passersby. 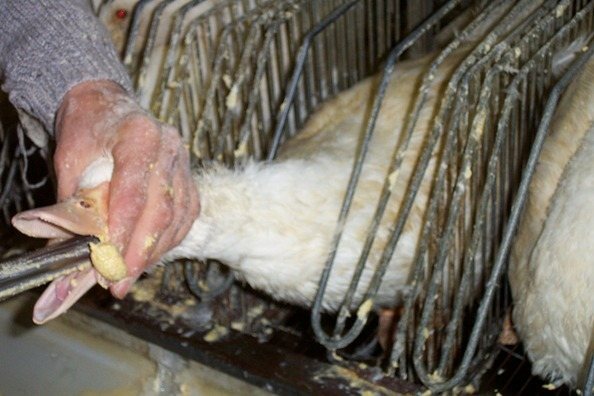 In 2004, Zogby conducted a poll that revealed 77% of Americans believe force-feeding ducks and geese to produce foie gras should be banned in the United States. Given the recent ban in California and the increased national awareness that has resulted from undercover investigations on factory farms, that number is likely even higher today. I discussed this issue on my radio show. With your help, we will move from restaurant to restaurant throughout Florida and eventually the United States spreading a message of mercy for animals. Hopefully restaurant owners and patrons will make a compassionate choice and choose not to sell or buy foie gras. 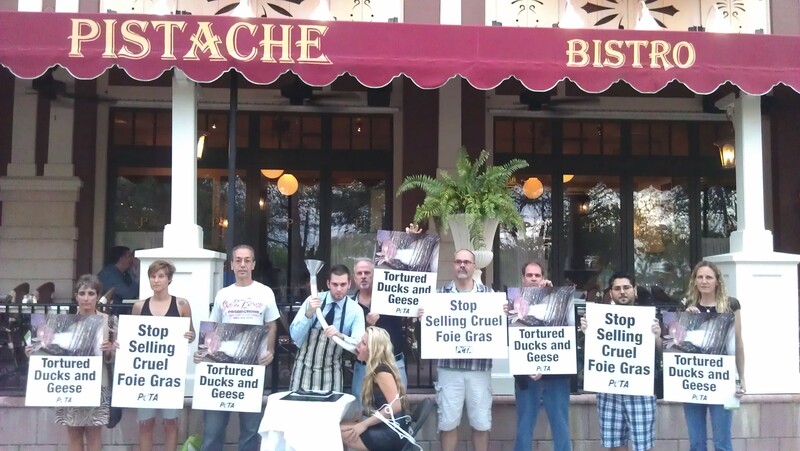 We will simultaneously lobby the Florida legislature to make the sale of foie gras illegal. In the process, hopefully people will also gain insight into the mistreatment of pigs, chickens, cows and other animals on factory farms and choose to eat more plant-based foods — a healthier and more humane option that also reduces environmental destruction. If it’s not all right to force-feed your dog or cat or your child, why would it be all right to force feed a duck or goose? Simply because they may not be as cute as your dog or they’re not household pets doesn’t give us the right to torture them. Many ducks and geese actually die from the force-feeding. That’s not all right. Please join the cause and help us end the sale of foie gras by sending my letter to local restaurants in your area and consider speaking with your state legislators to sponsor a law banning the sale of foie gras. As each domino of cruelty to animals falls, others will follow. Please help us knock this one down.